Is All This Tariff Talk Real? I hope Not! Is all the Trump tariff talk real? Or is this just a better-orchestrated rehash of Trump vs Pina Nieta 2017? Do you remember when President Donald Trump begged Mexico to pay for the wall, or failing that, at least not to say publically that they wouldn’t? But the idea behind the phone call to Mexico, cited in the link above, was to create theater around the border wall issue. I believe that by mid-2017, the Donald already realized the slim chance he had of getting a needless wall built. But his entire political trajectory is predicated on him being the Ultimate Deal Maker. Building the wall was supposed to be one facet of this title. He isn’t a great deal maker. He never was. As streetpolitics.us has pointed out in other pieces, citing a variety of sources, Trump was never the big deal maker in the multi-billion dollar empire that bares his name. He was the face man. He was the dog-and-pony show that kept the flamboyant public image of empire alive, and the big money marks occupied, while the real deal makers hammered out real business. Ultimately, after it became apparent that he had no mature interest in the actual running and monetization of the corporation, the board fired him from positions of real responsibility and paid him a monthly stipend to stay on as the public entertainer-in-chief. But hey, it’s an image, right? But when it came time to actually perform, we found the Donald woefully lacking. For example, when Trump did call Mexican President Pena Nieta in 2017, not only did he tip his entire hand, leaving himself no avenue of attack or retreat, he made a series of cringe-worthy gaffes which for some reason, even his political detractors didn’t really hammer him for. But Trump displayed an ignorance of parlay not seen since the Duke of Edinburg demonstrated the diplomatic skills of a Moe Howard on Chinese soil. 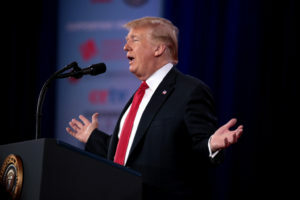 Along with racial groupings that only a modern “liberal” would conflate (because modern liberals are racist), Trump suggested to the president of another nation, that although his “wall” was the least important thing being discussed, that it would be helpful TO TRUMP if they would pay for the wall or at least stop saying they wouldn’t. This was tantamount to begging someone of an opposing point of view to pretend not to be, so the requesting party might not be made to “look terrible”. I’ll try to address the racial gaffes in another article. My to-do list grows exponentially with such asides. If so, then the worst you can say about this “trade war” dust up is, at least in private, the leaders of the world are giggling behind their hands at the President of the United States. After a few months of posturing and stock market drama, all things will settle back to where they are right now, with a few meaningless, token changes. Trump will declare victory and the our trading partners will be happy to let him do so because they will continue to gauge our exports as they have for the last 50 years. I can live with the embarrassment. I would be disappointed with the result. But what if the tariff talk is real? What if Donald Trump really intends to use a tariff war to “help” the U.S.? Is it possible that someone who has no understanding of history or economics convinced him that haphazardly slapping several countries with tariffs is a good idea? I will stipulate that among Facebook bozos and talking heads in the “Entertainment News” business, there is almost no understanding of history or economics. Most people in those two intellectual ghetto forums are motivated by what is politically helpful to my tribe? But when White House advisors start telling someone as pliable as Trump that protectionism is GOOD for our economy, well… Houston, we have a problem. Assuming this is not a stunt, this is how Trump’s present course of action will pan out. We are hitting several key trading partners (I use that term advisedly) with broad, impulsive tariffs. They must respond in kind for their own domestic consumption. This includes China. It can be argued that they need our markets more than we need theirs. That is mostly true, but as you will see, hardly of any help in this scenario. Very quickly, trade will slow, production will slow, and people WILL start losing jobs. Companies with the money and dexterity to quickly move production into countries, considered our to be “trade war” enemies, will do so. This will minimize some of the damage they will endure. These companies will be punished (mostly with rhetoric – look at Harley) by our deal-maker-in-chief. No one will actually be able to do anything to them legally, except congress, but there isn’t a gonad to be found among the entire 535 creatures there. And so it will go. Eventually, no country will be able to sustain the economic hostilities. Slowly, quietly, the barricades will be dismantled, and as before, all belligerents will slowly retire to about where we are right now. As was the case in Cuban missile crisis, all countries involved will make some token gestures that will leave their home audience thinking they are strong and the international community thinking they are magnanimous. Everyone will get a participation trophy. …The market sentiment and economic trend created with Trump’s election will be over. In fact it will see a huge reversal. Everything we have enjoyed over the last two years will be wiped out. And this COULD all happen by November of 2018. That means we could be looking at a real “blue wave” as opposed to the imagined one of today. This is one reason I have still not completely let go of my old Trump-as-democrat-shill theory. It all depends on whether we are looking at an opening gambit, with real free trade to be proposed in the ensuing weeks or if Trump and company are actually stupid enough to follow through on the existing threats. Real free trade is just that; no tariffs, no subsidies, no protectionism. In my next economic piece, I will discuss REAL free trade and why we need it now more than ever. Don’t be a political pansy! Read Street Politics: It Ain’t Your Daddy’s GOP Anymore!